Acer on Sunday became one of the first PC makers to show a laptop with Intel's upcoming Core processor code-named Ivy Bridge, which will deliver better appplication and graphics performance than current Core processors. Acer showed a working unit of the Aspire S5 laptop, which the PC maker called the world's thinnest, at the Consumer Electronics Show in Las Vegas. The thin-and-light laptop is scheduled for release in May to June. The S5 falls under a new category of laptops called ultrabooks, which are being heavily backed by Intel. The low-power chip enhancements come as Intel tries to improve ultrabooks with tablet-like features such as always-on connectivity and quick start times. PC shipments slowed down last year partly due to the onslaught of tablets. Intel hopes to blur the line between laptops and tablets with ultrabooks. Users will see significant application and graphics performance benefits with Ivy Bridge chips, which will succeed the current Core processors based on Sandy Bridge microarchitecture. Acer has measured a CPU performance improvement of more than 20 percent over Sandy Bridge, while the graphics performance is about 30 percent better, said an Acer representative at a press event. The chip helps the S5 laptop deliver more performance without compromising battery life, the Acer representative said. The S5 laptop delivered about eight hours of "uncompromised" battery life and a high-level of component integration has helped reduce the laptop size while retaining battery life of the S5, the representative said. The S5 also has USB 3.0 and Intel's latest Thunderbolt connectivity technology. Laptops with Ivy Bridge will also deliver more realistic graphics. 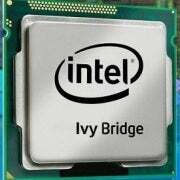 The Ivy Bridge chip, which integrates a CPU and graphics processor, will be Intel's first to support the DirectX 11 graphics technology. Intel has said laptops with Core processors based on Ivy Bridge will become available in the first half of this year. Lenovo last week said it would release laptops with Ivy Bridge in the second quarter. The company is expected to show the laptops at CES.